Gun violence: What will really change the statistics? @rklindgren May 28, 2018 October 28, 2018 2 Comments on Gun violence: What will really change the statistics? The wave of mass shootings in the U.S. continues unabated and, based on my prior analyses of the math behind the shootings , it will get worse because Americans can’t or won’t deal with that math. It will get worse because the root causative factor is, simply stated, the ready availability of weapons, and the root predictor of “high-lethality events” is similarly the ready availability of “high-lethality” weapons and ammunition. My approach is to think of this basic availability of weapons as a primary stressor on the “cultural chain” of people and events in the United States today, much more so than in any other developed country. People with mental illness, or radical religious believers, or students wearing trenchcoats, or other questionable “causes” touted by pundits, are at best thought of as “weak links in the chain” (if they are indeed significant at all). You could try to improve the strength of every link the “cultural chain,” but we will get the biggest impact by reducing the overall stress on the chain. The chain itself is only as strong as its weakest link, and there are millions of what I call “casualties of culture” who, for a myriad of reasons, may be pushed beyond the limits of coping on any given day and also have a weapon available, which is exactly what makes the United States different from the rest of the world. There are millions of people at any point in time in the rest of the developed world under stress equal to or greater than that of Americans, but they invariably have less access to the most lethal weapons, and thus there is statistically less gun violence. You or I may well be among those over-stressed people, by the way. But I am personally at a very low-risk of committing gun violence solely because I have no easy access to guns. And if you are female, your statistical risk of being a “mass gun violence problem” is pretty close to zero, regardless of the stress you are under. This second reality, by the way, is one that gets far too little press. 50% of the population is of relatively-negligible risk, and we can’t seem to learn anything from that fact. So how do we best “reduce the stress on the chain”? For starters, I prefer to divide the issue into three manifestations of gun violence. First, there is the basic rate of overall gun violence of all types, with deaths currently right in the range of the number of automobile-related deaths in the U.S. Second, what I call the “high lethality” events are a special case of gun events, but these are the ones that get the news coverage, and perhaps a disproportionate amount of the public fear. Nevertheless, their special circumstances need to be addressed. Finally, the single-largest category of gun death is suicide. The most likely victim of your own gun is you or someone that you know. Any given attempt to address this issue may impact just one of the three, but somehow all of these need to be in our vision. Add to this the question of which options are best accomplished by state versus federal legislation. The chances of the latter look poor for some time to come. Then there is Second Amendment constitutionality, although I believe this issue may be overblown and over-feared. Finally, there is the difference between “popular culture” remedies versus what will actually lower the statistical rates. Math is not the strong suit of most Americans, so the most popular remedies may not be the most effective. There are several good lists arraying proposed abatements and remedies on different criteria of projected effectiveness and public support. I want to toss in three that don’t, in my view, get enough attention given what I think is both the potential statistical benefit and the legal achievability. As soon as you mention “assault weapons” to a Second Amendment radical in an online forum, you will get inundated with assertions that there is “no such animal.” You will get picked to death by pedants citing obscure gun specifications (and I have). Those very detailed specifications do demonstrate, however, the data that support what I call a “lethality index” for both types of weapons and for types of ammunition. The purpose of a defined “lethality index” is to put some quantification on the statistical threat. Indeed, it is likely that weapons manufacturers already have much of this information in their attempt to “optimize” their products. A “lethality index” would measure how much damage, and to how many large mammals, a weapon and its ammunition could accomplish in X amount of time. These three factors statistically determine to a large degree the size of a single gun event’s impact. A knife, for instance, is a “low-lethality-index” weapon, as is a pellet gun. You can kill people with either, but both weapons are “inefficient” at their task. The reason you see knives used in acts of violent desperation in Europe is precisely because it is a last-ditch alternative, and a poor one at that. By the same measure, an AR-15, whether you call it an “assault rifle” or not, is definitely a “high-lethality-index” weapon. Some conventional hunting weapons may well push into that end of the “lethality scale,” but most pale in this regard to the many variants descended from military weapons. I put these two items together because the first helps to enforce the second. There has also been, to my knowledge, no ruling against the constitutionality of reasonable requirements for the same types of liability coverage on weapons required, say, for the ownership of an automobile. Nor is there any reason why guns cannot be required to be kept in well-secured locations, away from teenagers and impaired adults, for example. The required level of security of the weapons could well be a function of lethality as described above. And some weapons should only be available at well-regulated and well-insured shooting facilities. Insurance is a “free market” approach that would no doubt require the legal weapons owner to implement some security efforts. As is the case with uninsured motorists, this is no guarantee of compliance, but it does provide for preventative action when uninsured weapons are encountered by police and other responsible community members. It also helps to create and enforce a “social norm” of individual responsibility, which is a supposed hallmark of a conservative society. Secured access not only lessens the probability of a young person getting access to weapons, but it has also been shown to lower suicide rates as well. Suicide by gun is less a function of mental illness than it is of simple availability of an “easy and effective option.” If guns are harder to access on a “whim,” then it is very likely that gun-related suicides could drop precipitously. See the Army suicide study linked in Note 1 below, which indicates that as many as nine out of ten gun suicides can be prevented in this way. Gun registration is clearly constitutional, and yet the “loopholes” are quite well-known, most of them intentionally kept in place. For instance, the insistence that firearm transaction records be kept in paper form is particularly egregious given the technology we use every day. The technology clearly exists to track this chain of custody by electronic means. In practicality, a national solution to this is likely not possible, but cooperating states and cities could make this process more uniform and efficient for the parts of the country that are truly committed to reducing gun violence rates. The curious thing about the recent spate of gun violence incidents is that the feared “criminal with a gun” issue, while still a problem in pockets of some cities, seems to be losing ground to “basic gun nut with a gun” in terms of the perpetrators of violence. The very act of owning multiple weapons raises the statistical likelihood of problems significantly. Efficiencies in custody records can both provide important information in tracking of stolen weapons and after-the-fact evidence gathering. Remember that the key objective is not eliminating gun violence, but rather bending the “rate curve” downward, a goal which certainly can be accomplished. The sad reality in the United States is that most of us (almost all women and young children, and over half of the men) are statistical iotas in the middle of a “high risk sea” of irresponsible gun owners. And yet, we can’t seem to make any progress here in making our public places safer. More guns (the NRA proposal) makes our public places less safe, and it is time for the rest of us to take them back. None of these proposals “stops” gun violence. But in my view, they could make the “gun violence lottery” harder to perversely “win” and reduce the number of casualties from any given incident. It just takes the willingness of voters. See my earlier posts in this blog: “The gun violence lottery”, “The “mentally-ill shooter” fallacy”, and “Army suicides and gun policy”. One of the best recent lists, in my view, is Sanger-katz, Margot, and Quoctrung Bui. 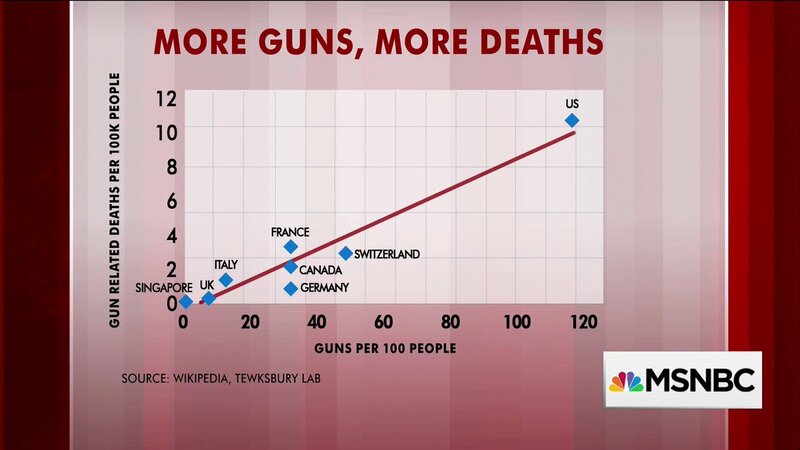 “How to Reduce Mass Shooting Deaths? Experts Rank Gun Laws.” The New York Times, 5 Oct. 2017. “Gun Registration Paper Trail Is Long And Convoluted.” NPR, 11 Apr. 2013.